Need a strategy for mobile content? We wrote the book (literally). Mobile isn’t just smartphones, and it doesn’t necessarily mean you are on the move. It’s a proliferation of devices, platforms, and screen sizes—from the tiniest “dumb” phones to the desktop web. How can you be sure that your content will work everywhere, all the time? Karen McGrane will teach you everything you need to get your content onto mobile devices (and more). You’ll first gather data to help you make the case for a mobile strategy, then learn how to publish flexibly to multiple channels. Along the way, you'll get valuable advice on adapting your workflow to a world of emerging devices, platforms, screen sizes, and resolutions. And all in less time than it takes you to fly from New York to Chicago. Filled with mountains of data—not to mention Karen McGrane’s dry wit and experienced perspective—Content Strategy for Mobile is a timely, important work. Karen McGrane’s Content Strategy for Mobile brilliantly describes our biggest challenges—and opportunities—in the “wild, wild west” of content. Required reading for all my clients. How do you ensure you've got the best content every way your customers want to access it? Karen McGrane delivers an amazing set of solutions to the challenges of today's content-rich, multi-device world. This is one of those books you'll find yourself quoting from weekly. Karen McGrane’s book provides an easy-to-follow guide on what a future friendly CMS looks like and practical steps on how to get there from here. In an age when tap is the new click and small is the new big, Karen McGrane takes us on a mandatory tour of our new content, now mobile. 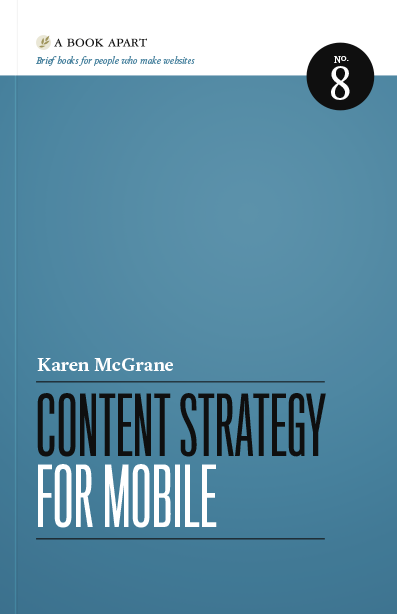 Just got my copy of Karen McGrane's Content Strategy for Mobile from A Book Apart. She misspelled “Strategery” but awesome otherwise.